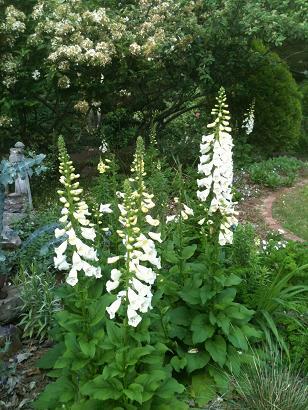 Foxglove – Plant It This Fall For A Beautiful Spring Display! 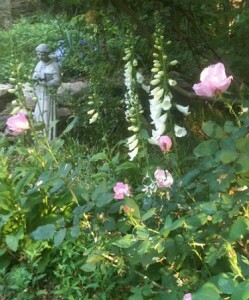 Foxglove, Digitalis purpurea, is the quintessential English garden flower. It’s beauty has graced landscapes of great gardeners for hundreds of years, as well as those of more modest means. Considered a biennial, foxglove is purchased as small transplants in the fall, growing through the winter and reaching their peak flowering time as the roses begin to bloom here in Birmingham. Plant them in a partially sunny spot, ideally one that will receive some shade in the afternoon. This is especially helpful as temperature begin to rise in the spring and will help them bloom longer. Be sure your soil is loose, and add soil conditioner, shredded leaves, or compost if necessary. Mulch them with shredded pine bark or pinestraw after planting and Keep them watered during dry spells. Foxglove look particularly lovely against an evergreen backdrop or a wall of some sort. Combined with other spring annuals and roses, they are reminiscent of a classic cottage garden. Once they’re through blooming, plants can be left standing to drop seed, (You’ll see baby plants the following summer if this happens.) but they do get a bit bedraggled looking at this point, and I prefer to pull them out, replanting each fall. 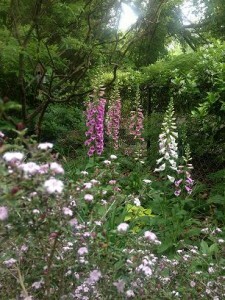 This entry was posted in Fall, Flowers, Planting Tips, Spring and tagged digitalis pupurea, foxglove, spring flowers on October 16, 2014 by Kris Blevons.